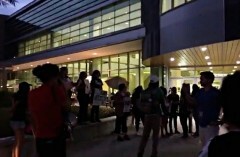 USF students protest “alt-right” journalist Milo Yiannopoulos | Fight Back! Tampa, FL - On Sept. 26 over fifty students and faculty gathered to protest racist, sexist, LGBT hate mongering journalist Milo Yiannopoulos. 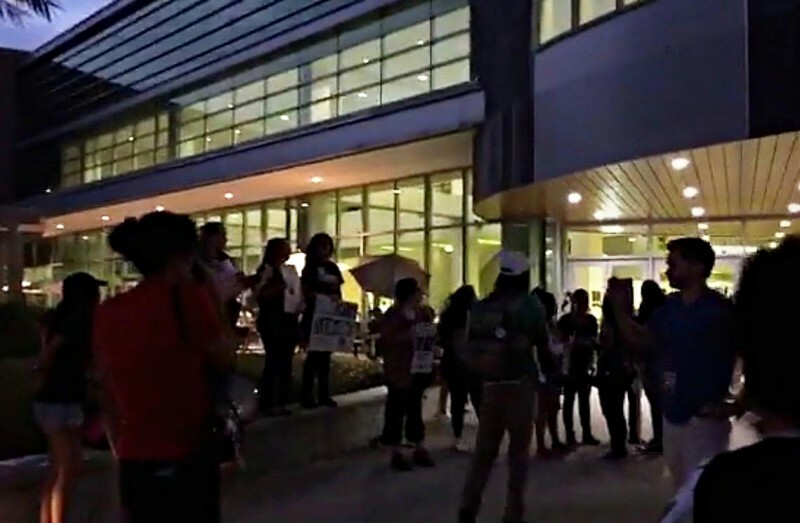 The protest rallied in front of the Marshall Student Center at the University of South Florida (USF) where Milo was speaking. Milo Yiannopoulos is a self-described “alt-right” journalist and known supporter of Donald Trump. His career is based on hate speech towards people of color, women, and LGBTQIA+ people. Noah Peretz of Tampa Bay Students for a Democratic Society (SDS) said, “Allowing Milo to speak on our campus shows administrators do not care about the wellbeing and happiness of students. Instead, their loyalty lies with right-wing bigots”. “Students standing up against Milo represent the fact, that he is not someone that we, the students, want to associate ourselves with. He is someone who does not represent the views of the majority of the students that attend USF”, said audience member Yoana Dominguez. Though disturbing, Milo Yiannopoulos’ presence on campus was not surprising to many, as USF administrations have historically ignored the demands of progressive students on campus. Over the last year, Tampa Bay SDS has waged a “Change the Name” campaign targeting the C.W. Bill Young Building. Young was a Republican politician and LGBT hating politician who persecuted LGBTQIA+ and communists in a “pink and red scare” of the McCarthyist era targeting students and faculty across the Florida University system. The USF administration continues a policy of LGBT-phobia on campus by rejecting the demand to Change the Name, and also by allowing the hate-monger, Milo Yiannopoulos, to speak on campus. The event ended with students chanting, “Administration welcomes hate; racist Milo out of our state” and “M-I-L-O! G-T-F-O!” A large number of students expressed their support for SDS and their desire to commit themselves to the fight for LGBT rights and equality on campus.